When an attack is desired, the wearer can decide to discard two hand cards to generate the attack. If a player has this equipped, the ability can be called upon both during and outside of that player's turn. Within the turn, that player can use any two cards to attack another. Outside of their turn, the ability can be used in response to tools such as Duel or Barbarians. Both of the cards must be from that player's hand and must be discarded at the same time. For the color of the attack that is generated, both of the cards used are taken into account. If both cards have the same color, that is the color of the attack. If the two cards are of different colors, the attack is considered colorless. 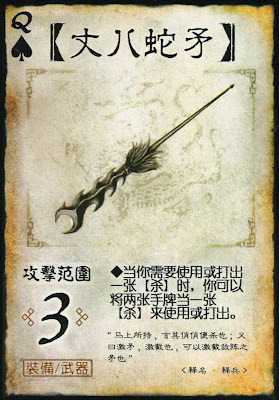 Zhang Fei can use this weapon to the extent of its power. Since he can attack over and over again during his turn, he can use any two hand cards each time. This allows him to use almost his entire hand for attacking. It doesn't matter what cards he has, he can use them to punish his foes. The Serpent Spear is a useful weapon at the right time and at the wrong time. When things are going well, this is a reliable weapon to have when on top of the game. It has a good range, and an ability that you can use in a pinch. If you're struggling to get by, odds are you are not getting useful cards. This is not a problem for your weapon. If you don't like what you draw, you can just throw it down to attack someone. When trying to use cards, this is the best tool for the job. Anything can be used, and even better you can use two useless cards, and turn them into progress. Zhang Fei was the weilder of the Serpent Spear. It was made in the very beginning with the weapons of his two brothers. He kept it with him during all of his numerous battles. After quelling the Yellow Turbans, the next major conflict it saw was against the mighty Lu Bu. Zhang Fei was the first to ride out and meet the challenge. Despite needing aid from his brothers, he became renown as a warrior. Zhang Fei even deterred Cao Cao's fearsome legions with a loud roar. The other great duel that this weapon participated in was against Ma Chao. Zhang Fei had his weapon until his death. After that, it was passed to his son, Zhang Bao, and used in Zhuge Liang's northern expeditions.